I made them in lace fabric. In this lace, I made a simple sack dress for me and then made a pair of these wide and skirt-like pants. The latter turned out very pretty pants for my daughter who looks lovely in romantically chic(if you can imagine that) outfit. The pattern I used is a japanese pattern which is called "simple wide pants with an elastic waist band that are easy to make" from Polkadrops. The name says it all! I lined them with a light cotton lawn and made the elastic band casting with a heavy silk shantung. I'm pretty happy with the result, so is the daughter. She was kind enough to volunteer to pose in the blog photos again. Thank you, my girl. Now I think I finished my high summer sewing with these. Free size (however, the size was much adjusted for the wearer when printing out in this case), lengthened, lined. I have another name for these: split skirt. What a GORGEOUS fabric choice. These are so feminine and lovely. Also, love her hair, such a rich color and so shiny! I absolutely love these culottes. That is what we call them. Whatever; they are lovely. Thank you!! We call them culottes mostly, too. Thank you, Carolyn! She seems looking better in white and other light colors like I do. The interesting point is that she seems being good at wearing girly outfits, which is totally different from my case. I thought it was you in the photographs! You and your daughter are very alike! They are lovely pants. I wish my daughter had known about your fabric shop when she visted Kochi last year. Beautiful. 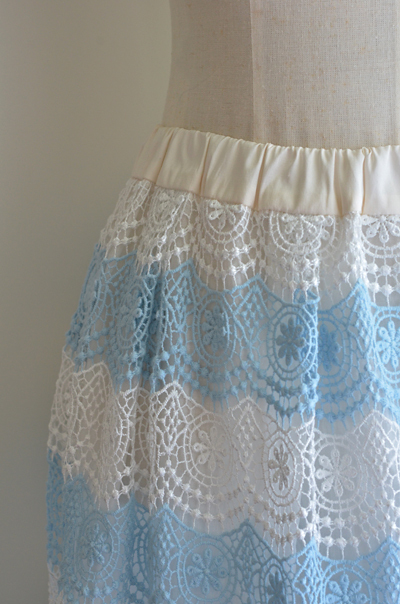 I would never have thought to make culottes from that lace, but it's just perfect. Thank you very much! I'm so happy that they turned out very pretty, but not too pretty in a bad way. those are so beautiful. in that first photo she looks like an image in a lovely fashion magazine. Like mother, like daughter...she is as stylish as her mum, and looks amazing in those soft colours. The fabric: Absolute perfection! Beautiful! Love the color palette of her whole outfit. This is absolutely beautiful. I love the pictures!! So beautiful! Every time I open one of your posts, I feel as though I should whisper. Your garments make me feel serene. The lace is so pretty. These are gorgeous! You daughter looks beautiful in them. 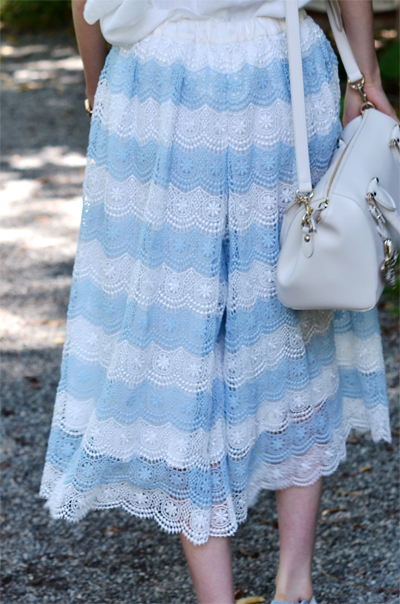 I would never think to make culottes in lace but these are a winner. I love this skirt! I think that it was absolutely great idea to buy this fabric, it is awesome! So tender and girlish! You really look like a flower in this skirt.